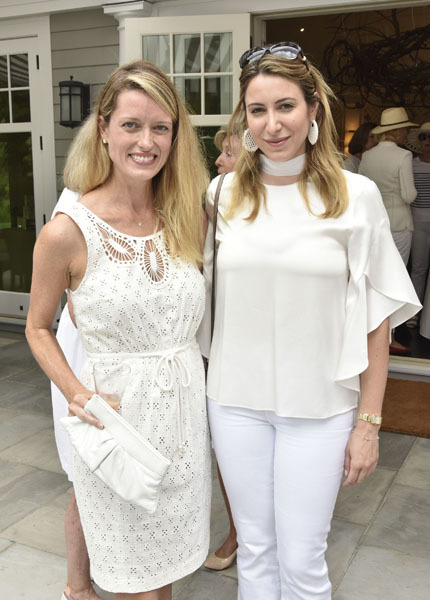 On Saturday, August 18th, the sun shined as philanthropist Audrey Gruss hosted 50 of her closest female friends for a White Tea Garden Party at her Southampton home, Fairwind, where guests were given the first look at Body Mist Light, the new product from the Hope Fragrance collection. 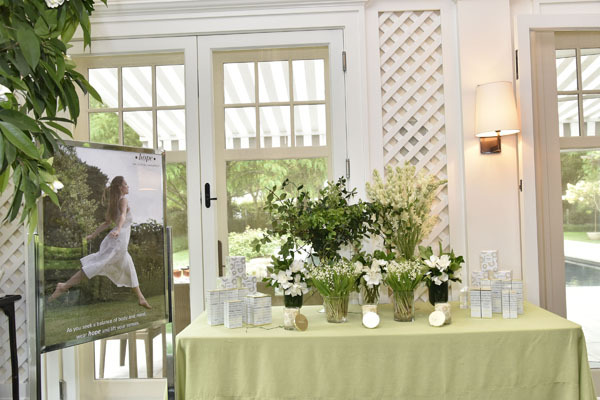 One year after Hope Fragrance launched, guests including Judith Giuliani, Sharon Bush, Hilary Geary Ross and Anne Eisenhower, learned how, with their support, Hope was able to launch a new product and were given samples to review in advance of the launch this fall. Depression is the number one cause of disability worldwide, with 20-million people diagnosed with depression in the US each year, and 350-million people affected globally. However, despite its prevalence and staggering cost to society, it is still misunderstood and under-researched. In order to create an additional source of revenue to accelerate breakthrough depression research, Audrey created the Hope Fragrance collection in the summer of 2017. Over the past 12-months, 100% of net profits from Hope Fragrance have gone directly to Hope for Depression Research Foundation (HDRF) – the non-profit organization Audrey founded over a decade ago in memory of her mother Hope, who struggled with depression. 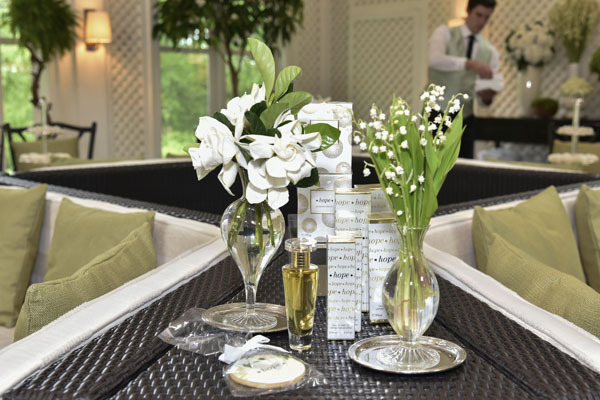 Classic white tea sandwiches were passed around, while green linen-covered tables, representing the crisp fresh garden notes of the fragrance, were laden with white coconut cupcakes, white teas, floral bouquets and petit fours decorated with the blossoms of the four white flowers that compose Hope Fragrance’s key notes – gardenia, jasmine, lily-of-the-valley and tuberose. 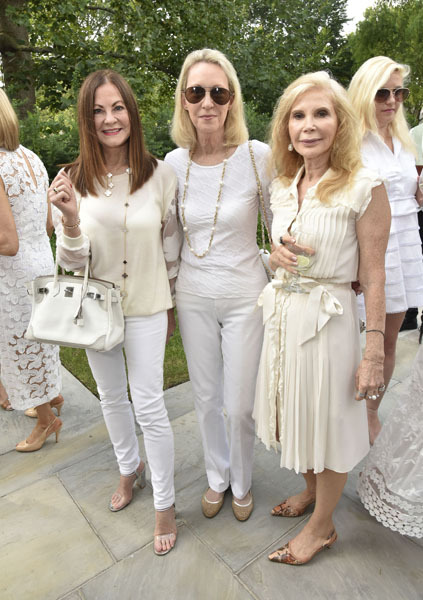 Guests including Debbie Bancroft, Katherine Embiricos LeFrak, Mai Harrison, Kim Heirston, Carol Mack, Nancy Schaeffel, and the legendary landscape gardener Edwina von Gal, were all dressed in white and roamed the grounds, which featured a white cutting garden, blooming white hydrangeas, a white and green woodland garden, a pool surrounded by white dogwood trees, that had gardenia flowers wired around them, an apple orchard and white birch allee. The Hope Fragrance collection currently includes an Eau de Parfum, an Eau de Parfum Purse Spray, a Hand and Body Creme, and a Scented Candle. The products range from $40 to $115 SRP, and are available to purchase at hopefragrancesint.com. The Body Mist Light will launch in the fall of 2018. HDRF’s mission is to fund the most innovative neuroscience research into the origins, diagnosis, treatment and prevention of depression and other mood disorders – bipolar disorder, postpartum depression, post-traumatic stress syndrome, anxiety disorder and suicide. In 2010, HDRF launched its Depression Task Force (DTF) – an outstanding collaboration of eight leading scientists, at the frontiers of brain science, from different research institutions across the U.S. and Canada. These scientists have developed an unprecedented research strategy that integrates the most advanced knowledge in genetics, epigenetics, molecular biology, electrophysiology, and brain imaging. To date, HDRF has provided more than $30-million through over 125 grants for breakthrough depression research that promises to transform the way depression is viewed, diagnosed, treated and prevented.